Looks like they don't want anyone to know what it sounds like clean. That's the marketing side I'm sure. Because it is what she does best. Not "clean" in the pristine sense. But rich and flavorful without the need for artificial diode created overtones, or even the harsh growly stuff most younger guitarists seem to favor. I bet you'd dig her as much as I, Caddy. True tone with no artificiality. Today I'm going to put her few her paces with a wide range of guitars. Gibbies. Fenders. That to discover her true strengths. But in fact she is so fifties that I think I already know. To me it is like coming home. Still would be nice to hear how it sounds very clean (the only way I, and many others, have ever played). jackdragbean, Kenneth Mountain and CVSteve like this. Now that sounds so much better. Really nice sounding amp, clean. That I can listen to. I agree. That sounds fantastic! I agree, or rather, why does everyone seem to crank up and have all this distortion and noise? I mean I get it. I listen to a lot of music that has it and a lot of my favorites have those overdriven tones, whatever.. But 98% of my playing is squeaky clean. I have a Vibro Champ that isn't louder than 2. Three at the loudest. I play with a light touch, finger pads only, no nail. Sometimes a thin pick. While some people crank it up for those odd order harmonics and overload, I prefer the other ones that are lost or drowned out by the gain stages. 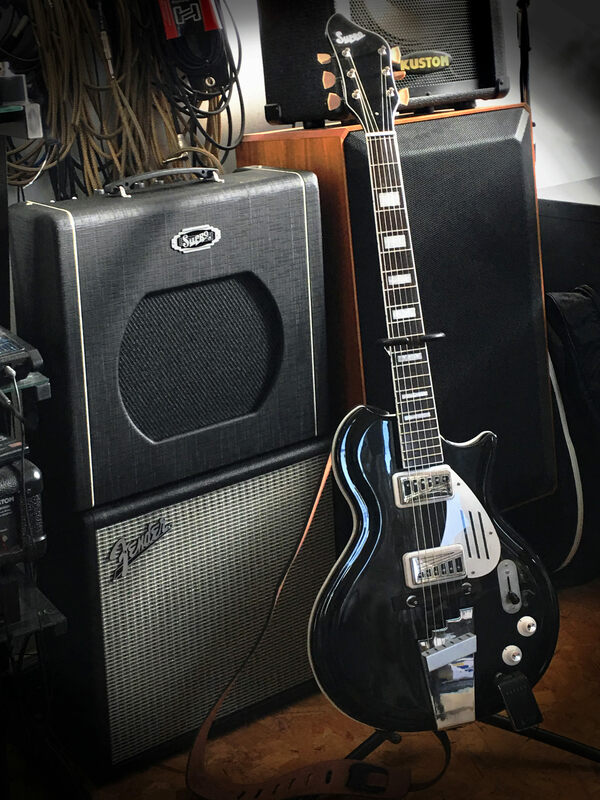 I went to my long-time friends house to hear his new Supro Black Magik and a Marshall Combo. First, he was running them through a power soak so he can over drive it and not be too loud. AND.. it was too loud. Hey.. I play in a band and we are LOUD!! !...….on stage. Both very different amps didn't sound all that different. All the character was lost into a wash of noise. And my ears hurt. So with mild interest I watched the video and though, whelp.. I have enough amps that do that and I can get that a variety of ways easy enough. Hard pass. Kenneth Mountain, ChinaCatSunflower and Caddy like this. Yes. Funny how the video begins with the boost and gain circuits on. Nah! It's beauty is au naturale. Class A, totally unfudged. Classic 6L6 bright, but through a warm, non-clinical sounding speaker. This "face melting" stuff... That's fine for the ad people. But as Howlin' Wolf sang "the little girls, they understand." Caddy and CVSteve like this. Now back to a full-sized keyboard, a bit more on this "clean" thing. Clean need not mean free of character. This is not the same as, for instance, when a hi-fi amplifier/speaker is being judged. Those reproduced sounds, and (theoretically at least) should add no color. While guitar amp/speakers create a sound. Truth is that for all the understandable fuss about major sound makers such as PUP configuration down to mini consequence things like wood and finish type, for much rock music that stuff is buried deep under all sorts of "distortion." -Some even called such. That was not always true. As in my eval above it was not true for my early years. In the Abs, be it live in large concerts, small club dates and in the recording studio my Vibroverb and Al Karp's Ampeg Reverberocket were never above 5 or 6. More often about 4. And in the studio we had to fight for that level. "Let us control level from in here" cried the engineers. I only used one pedal, and that only one song, a Maestro Fuzztone -- that, of course, for "Satisfaction." I actually remember saying to Al (who played a late fifties Les Paul) "we spent all this money to get good sounding guitars. Why would we ruin the sound that way?" BUT... those amps I mentioned did not sound the same. The Vibroverb had a sound of its own. Crisp and articulate. The Reverberocket did too -- fuller and warmer. Sometimes we'd plug into the bass player's Magnetone for a quite different sound. I remember those differences. As real as that between my ES125 and Al's 'Paul. Today I have a very clean mid-70s Twin Reverb. Reworked with new carefully chosen and biased 6L6s and new capacitors by a highly respected Boston-area amp guru. He, upon returning the amp to the Bostonian friend who'd brought it in for me, told him "tell your friend he has a really sweet sounding amp here." And for clean it truly is. If I played chicken pickin' it'd be perfect. Or even some sorts of Tele fretting in a more rock vain. But I use it little because its level of "pristine" just doesn't work fo me. I also have a Peavey with a cleaner than clean clean channel. (Yes, and a typical late-80s Peavey "Supersat" channel too.) That we use, clean, for Jan's keyboard. No, I prefer some personality, even in my clean beyond just being clean. That is what I was looking for in the Blues King 12, and although new (sonic deficiencies sometimes aren't really heard until the amp is an old friend) I truly think I got just what I was looking for. Note: With the "Boost" and "Gain" circuits OFF. What can I say? We are all products of our time. I grew up with the Ventures playing in one ear, and Hubert Sumlin wailin' in the other. I'm not about to kiss anyone's twisted sister. But pure guitar tone I love. Be they from California's clean beaches, or Chicago's dirty streets. Supro's got the later down pat. It is to my ears "it." For the other I wish I still had that Vibroverb. CVSteve and Caddy like this. Had another LONG session with the Blues King today. Trying various guitars. Getting a feel for the breadth of her capabilities. The reverb is far more lush than I expected. And to my amazement she sounded great with the Jazzmaster doing... surf. No, I didn't expect that! Very sweet, too with my 1980 Gibson ES-Artist. (This may be the first thing I share in a video) Worked on the old Muddy Waters piece "I've got my mojo working," amplifying an arrangement I created some time ago for acoustic guitar. Wow, if only I had a bass and some drums available! Anyhow, just loving this amp! Caddy and Hoss like this. As a point of interest, after finding how surisingly good the Blues King was with the VM Jazzmaster for surf and pre-surf (Ventures and the like), I thought I'd give the Supro White Holiday a try. That guitar has a GREAT trem system, and through the Twin Reverb can get some good, it not totally time-original, sounds with that music. Thru the Blues King no. Its PUP -- one of things that gives it such a great sound for primitive rock and blues -- just has too much output and sounds way too thick for that music with this amp. Yes, the right guitar with the right amp. That is key. Not just the guitar or the amp of itself. Hardly a revelation, but valuable to again see so clearly reaffirmed. Hoss and Caddy like this. Anyone get one and care to provide a review? I've had two lengthy sessions with it and so far it is fully meeting my hopes and expectations. She is a beautifully built amplifier. This is seen in every small detail. But it is her basic sound -- that before the hyped "Boost" and "Gain" circuits are activated -- that most shines to an older player like myself. I've played her so far with several types of guitars. First my Supro Black Holiday. A match (not surprisingly) "made in heaven." The amp has well chosen tone circuits, and these allow for greater than typical flexibility for an amp designed to sound as those from the fifties and sixties sounded. But even with everything set 'straight up' (apart from gain -- that I left at 10) she has the period feel that will be familiar to most any player who was active in those years. Yes, that includes me. Playing in small settings in the very early sixties, then in larger concert venues and the studio (with the Abstracts) starting in 1964. In none of those setting did we push our amps (into what today we call "distortion"). Nor, apart from a cover of "Satisfaction," did we ever use a pedal. But our amps then were sonically rich, not sterile. With personalities each unique to itself. I then played most often through a `63 Fender Vibroverb. My guitar pal (through several groups) most often through an Ampeg Reverberocket. The two did not need "distortion" to have each their own sonic signature. The same is, by today's standards, almost uniquely true for the Blues King 12. -This because of its basic amp design and, I expect (based on Supro's own claims), its custom designed for this amp speaker. The reverb is unexpectedly lush. So much so that I plugged in a Jazzmaster and played some delicious surf and pre-surf (Ventures, etc.) early rock instrumentals. The amp worked beautifully for genuine "clean" with that guitar, but with anything with greater PUP output (such as Supro's own Vistatones) the BK 12's preamp was overly "rich" for such music. She worked beautifully, however, with my 1980 Gibson ES-Artist. Getting a delightfully articulate growl and showing wonderful pick sensitivity. I've yet to find a use, myself, for the various provided methods for 'gain' increase. However I yet may. So far I am just enamoured with the amps' base sound. Truly "classic." Truly warm and appealing. Had another long session this morning. Not so much to make music, as to explore the Blues King 12 with various guitars. The American Standard Telecaster sang with her. And proved to me that the engineers who designed this amp knew what they were doing, because their words rang true as to the "Boost" function working great to thicken thinner single coils. Without it the Tele sounded wonderful. Even thinned out a bit by dropping the mids while slightly raising the bass and treble. Not really my sound, but a great and true Tele sound that will, I think, appeal to lots of rockabilly and country players. Left flat (all tone controls at 5) with the Boost off she was lovely with each PUP or both together. I can see getting a lot of Tele time on the amp. Boost on and she is still Tele, but just what Supro says: thicker. And yes, if you up the volume and lower the Master she gets a good grit. Again, not me, but sweet to the ears. My late `80s Paul sounded wonderful. (Dang, why is that guitar so heavy?) And my `94 SG Supreme with her `57 Classic HBs even better. To my surprise my P90 equipped guitars just didn't speak to me (at least this morning) through the Blues King. Unless I discover something I today missed they'll continue being played through the Champ type Joyo Sweet Baby -- for them just perfection itself. Still to be tried will be the Dano and the Strat. Their up for next time. Putting together what I have learned so far is rather complementary. The amp itself sounds great. She doesn't so much turn offballs into one-ofs, but allows great sounding guitars to show their stuff, highlighting what makes them special to begin with. The Supro Blues King 12, in other words, allows us to go back to the days of simple rigs. A well chosen guitar, a sweet moderate-sized (carryable!) amp, a pick and thou. And that, to me at least, is a great place to return too! PS -- What the hell the Gain Circuit is for I cannot imagine. "Face Melting" Supro calls it. My face ain't nothing to brag about, but melting won't to my knowledge improve it any. Pat V. and Hoss like this. That Blues King 12 looks better and better all the time. It was nice to see some Supro coverage in the February 2019 issue of Premier Guitar. An article about Richard Lloyd (guitarist for the band Television) has a couple of pics of his Supro Black Holiday that he calls his "current favorite stage guitar". A Supro Red Belmont, (with the trem removed like I've done to mine) a pair of Supro 1699 Statesman combos and a couple of Supro effects pedals are shown in the Rig Rundown for K.T. Tunstall. And...... a nice ad for the Blues King. duceditor, BlueSquirrel and Kenneth Mountain like this. Yes! That was nice to see! The BH is, I truly think, gonna prove to be a sleeper. One of those "damn, why didn't I get one of those when I could have?" geetars. I just love mine. And the Blues King 12 (which I expect will take off sales wise) just works with it so perfectly. Fedex always ticks me off. The driver never knocks or rings the door bell. Just leaves the package on the porch ... waiting for the porch pirates to steal it. I wholeheartedly agree!! I still cannot believe I lucked out and got a brand new Black Holiday with Supro case for $254.99... including shipping. It's my most played guitar at the moment and in many ways is my "number one" for now. It's just a joy to play. I also love my Red Belmont and I've acquired another res-o-glas Supro, (more on that one later) but the Black Holiday is super special to me.